Come with me down memory lane. 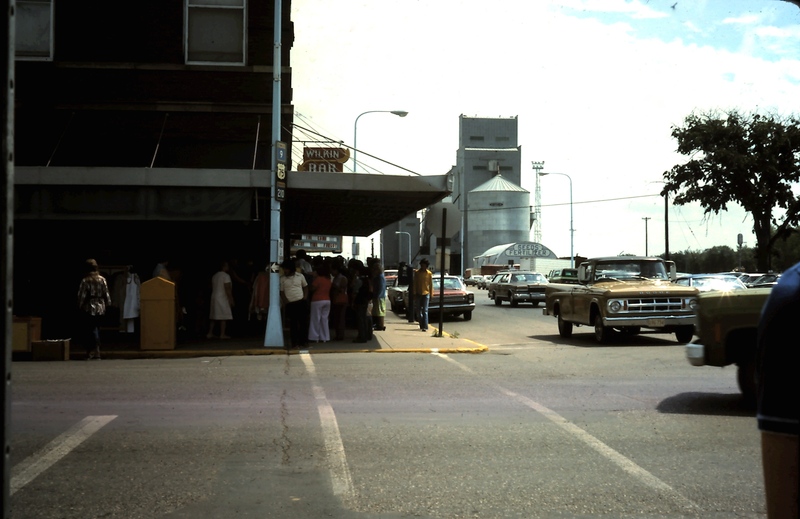 I want to show you Breckenridge, Minnesota, my hometown while I was an exchange student during the 1975 -76 school year. These photos, except for one, were taken when I visited in 2006. Breckenridge sits at the junction of the Otter Tail and Bois de Sioux rivers, where they form the headwaters of the famous Red River of the North. My host father told me that this position protected the township from tornadoes. It had never even occurred to me worry about such things. I thought they were a Kansas phenomenon. (Guess why that was!) But on Facebook, a few years ago, one of my friends posted some very scary footage of tornado damage in the Breckenridge-Wahpeton area. Water towers are a feature of every small town on the prairie. There’s one very similar across the river in Wahpeton, North Dakota.They strike me as a quintessential Mid-western form. Get this – I used to think the town’s water supply was stored in them! I know now that’s not right – or rather not totally right. Their main function is to do with water reticulation – especially the use of pressure to ensure supply. Here’s the main street of Breckenridge, Minnesota Ave, in 1975. Check out that Dodge pickup! The same street, in 2006. Not much has changed. Back then it was on the very edge of town. From our yard fields stretched to the horizon. The population of Breckenridge might have declined slightly but the area occupied by housing has increased. There is a 15th Street now. Cheryl , one of my good friends who happily showed me the ropes when school started, lived right across the road. 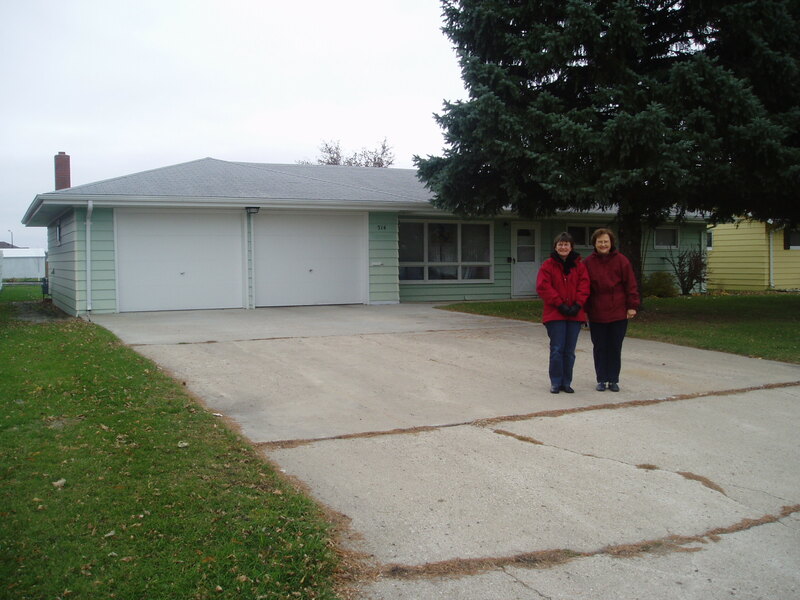 Cheryl, if you’re reading this – I have photos … The Wilkin County sheriff lived next door. He had a gun although I don’t remember ever seeing it. He was nothing like the sheriffs on TV – he was kind, mild-mannered, and very tall. Two blocks along 14th Street is Breckenridge High School. In the photo below you can see the school buildings at the end of the street. It was the centre of my life outside the home. The school is opposite the tennis court(!) – the scene of previously documented embarrassment. It was only late October when I took this photo but you could already smell the coming snow. During the winter the snow was piled along the road side and the wind howled along the street. The northerly might as well have scooped me up and dumped me at the North Pole – it was cold like I’d never been cold before, or since. Got itchy feet? I can help with that! How fabulous to make a return trip to what had to have been a year of major change. It was great to go back, Sue. Who knows maybe I’ll get to visit again! anyhow, when you mentioned the cold you felt – it reminds me as to why we joke around and call that state “Minn-e-snow-da” which I am sure you have heard. Lastly, doesn’t it feel like 2006 was just yesterday! Gosh – it does to me! Ah, Breckenridge Colorado! When the news came that I was being sent to a place called Breckenridge the only one we could find in my Dad’s giant atlas of the world was Breckenridge Colorado! And you’re right 2006 does seem like it was only the other day! And that is very scary. Ha! I do remember the flip- I bet that cake was extra delicious! Thanks, glad you enjoyed the post. It’s fun to look back at the old days, especially at the photos, but it makes me feel a bit nostalgic, too. Hi Jill 🙂 Many thanks for taking part and for the link. My grasp of geography in the USA is not all it could be. My only other Minnesota contact is Nicole at Thirdeyemom. Don’t know if you know her? http://thirdeyemom.com/ I’ll have to Google Breckenridge. We have lots of water towers in the Algarve too, but no longer fulfilling their original purpose. Hi Jo, Water towers are unusual here in NZ, so they really did grab my attention when I was in Minnesota. And thanks for the introduction to Nicole – what an interesting blog! The school looks like it was built from the same plans as those used to build the high school in our little town in New England. This town could be anywhere. Your experience helps make it unique. I’m glad to see they are still hosting exchange students. Hi Dan, it’s interesting what you say about the the school design – I noticed the other schools I visited did all seem very similar – I thought it might have been a regional thing.